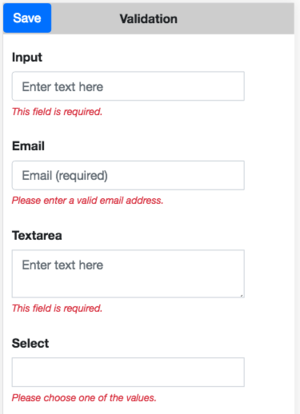 The Validation library is an option you can add to your project which checks if the input fields on your form are valid. Validation doesn't kick in until you ask it to validate the form. This lets the operator input data undisturbed. As fields are corrected, the error messages disappear. 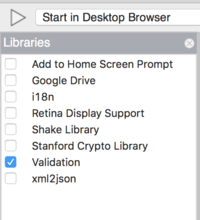 The first step is to add the Validation library to your project. Select "Project Properties and Global Code" in the Project Explorer, then select Validation in Libraries. When you start your app, you'll need to initialize your validation rules. Create a function for this and call it at startup. The NSB.validation() function call will have the name of the form you want to check as its first argument, and the validation rules as its second. Message: Input1: "This field is required. Message: Input2: "Valid email address required. You'll notice we left the rules and messages objects empty in the code above. It's time to fill those in. You can put this code with the rest of the code for your form. It only has to be executed once, at startup. Each rule and message is identified by the id of the control it refers to. The value of the pair is a simple work, like "required", or an object which tells more about what is required. If you don't include a message for an id, a default message is used. You're encouraged to make custom messages for all fields. This causes the validation to run. MsgBox "Form checked - all fields OK!" MsgBox "Please fix indicated fields." This page was last edited on 31 October 2018, at 12:42.